The Addison Swivel Chair is designed with an open, modern weave to provide a cozy nook in your backyard. The Addison rotates 360 degrees and will be a statement on your front porch, patio, or by the pool! The Addison Swivel Chair is available in a stone grey, synthetic wicker material. With durable, dark charcoal coloured polyester cushions, the Addison will look great in any outdoor setting. Add a fun accent pillow for a pop of colour! 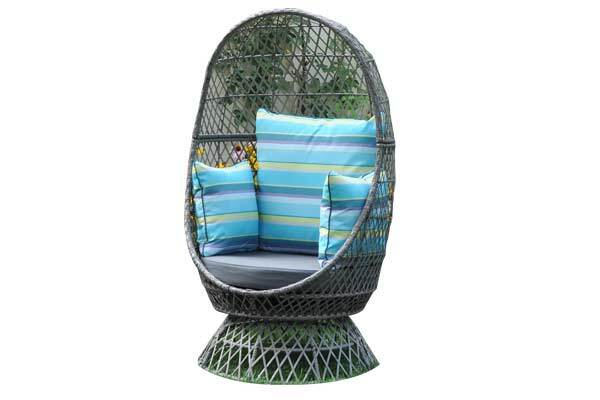 The 360 Swivel Basket Chair is a novelty piece that will add interest and comfort to any backyard. 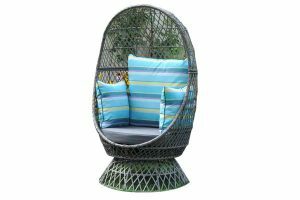 Available in a modern, grey, open Resin Wicker Weave with coordinating charcoal outdoor seat cushion and bright blue stripe toss pillows.